How do you split household chores once you’re married? Yesterday I tried to answer a question from a woman who is frustrated with always having to pick up her husband’s clothes, which he would leave scattered AROUND the hamper rather than IN the hamper. They both worked, and it didn’t seem fair that she should have to always clean up after him. She was starting to feel like his maid. So I thought today that I would explore this further for Top 10 Tuesday, with ten principles for dividing household chores. Whether you work outside the house or not, this is a discussion that every couple needs to have. I once knew a couple that believed in splitting money 50/50. So when they got together, they each paid for 50% of the expenses. Then, when they had a baby, she had to get her mom to baby-sit so that she could go back to work and still earn enough money to pay for 50% of the income. That would only be “fair”. Or it would be insane, in my opinion. One of the benefits of marriage is that you can each do what you’re best at, and you can reap the benefits of specialization. Here’s how that works: the person who can find work the easiest and earn the most money can work full time, while the other person can be flexible and arrange his or her job or housework or anything around the earning spouse’s job. Or, in other areas, the person who enjoys numbers and Excel spreadsheets the most can handle the finances. It’s very hard for you each to handle 50% of the finances; it makes far more sense for one person to handle them while the other does something else. My husband’s allergic to grass, so he’s never been able to cut the lawn. But he’s great at numbers! A household will run more efficiently, and everybody will be happier, if people are able to do what they’re best at and what they prefer. My husband hates laundry, so he doesn’t do laundry. I hate trash, so I’ve never done the trash. When we got married, we each declared what we absolutely hated, and the other person took on that task. It’s much more fun than demanding that each person has to do 50/50! While you can specialize and allocate jobs based on people’s skills, preferences, and time, childcare should never go to just one parent. While one person may do the majority of it, the other parent simply must be involved as much as is possible, because children aren’t a task to be split. So just because one spouse may do paid work while the other does the childcare does not mean that the spouse who works outside the home doesn’t have to do the bedtime routines. Kids need both parents. Full stop. My husband is a pediatrician, and he works in a department with seven female physicians. Several of them are the main breadwinners in their families, while their husbands stays home with the kids. As a couple, you get to decide what works best for your family. There is no one-size-fits-all. The main questions are: Are your children secure and well cared for? Do you feel like you have time as a couple? Do both of you feel valued and respected? If that is true, then who does what should not be as important. And that applies to other chores, too. Men do not need to be the ones to do the finances. Women do not need to do the cooking. You can each choose what you like the best and what you’re best at. Don’t try to divide chores 50/50. And there are two ways we do this: either we try to divide EACH chore 50/50 (you make half the meals; I wash half the dishes; we take out the garbage every other week), or we try to each work 50% of the time. But as soon as we start trying to quantify things we open ourselves up for silly fights. How do you classify reading to your children? Is that work, or not? What about having a heart-to-heart with your 4-year-old? Work? Or good for the soul? What if he works full time and you’re with the kids, but you think his job is “fun” because it’s exciting and he gets a lot of time to himself? Is that as demanding as your time with the kids, even if you get to nap in the afternoon? If you’re expecting your spouse to do his share, then you’re always looking at him asking if he’s living up to his end of the bargain. That’s a recipe for constant resentment. I think we should each put our all into a marriage–100-100. That’s the model. Even if you do divide up chores, everyone should know how to do all chores, because sometimes life will kick in and you’ll have to pick up your spouse’s slack. If he does the finances, you still need to know where to locate your insurance documents, banking documents, credit cards, and wills. He should still know how to make a few meals. I’ve seen couples in their later years run into major trouble because their entire marriage they never did certain things, and then when they lose their spouse, either to death or to a temporary illness, the tragedy is made that much worse. As I wrote in To Love, Honor and Vacuum, some men wouldn’t notice a dust bunny unless it obstructed their view of the television. And I told of one woman who was so sick of doing the dishes she steamed and fumed and decided she would just leave them until he did them. What's To Love, Honor and Vacuum--the book? Do you feel more like a maid than a wife and a mother? I get it! And I have the solution. To Love, Honor and Vacuum looks at how we can figure out what our priorities are and live them out–in our relationships and in our housework–so that everybody feels respected. If you feel chaotic and taken for granted, this can help. There was only one problem. Her husband, before he married, liked to use every dish in the house before doing dishes. Having dishes on the counter didn’t punish him. He honestly couldn’t care less. So she was only punishing herself. If we’re going to assign household chores, we have to allow the other person to have equal input on what completing that chore means. To me, for instance, “taking out the trash” means cutting up all the cardboard boxes and putting them in recycling so they don’t build up in the garage. To Keith, it’s perfectly acceptable to leave those boxes there for a few months until there’s a huge pile, and then tackle them. Now, I could make a big stink about that, because he’s not doing it my way. But the trash is Keith’s purview. And so he’s allowed to decide what’s “good enough”. We all need time to take a mental break, when we have no responsibilities. Some people actually get that at work. At their lunch hour they can take a long walk or go to the gym or just relax. But some jobs don’t allow that (my husband is under constant pressure at work). And staying at home, even if it looks peaceful and idyllic, isn’t really relaxing, either, if you are always responsible for children. So I think making sure that each spouse has a few hours a week where no one has any demands on them is vitally important. Some can get that at work, but some can’t. And being with the kids, even if they’re napping, doesn’t count as a break. If you do assign chores or tasks at home, remember that people tend to complete them better to a system. 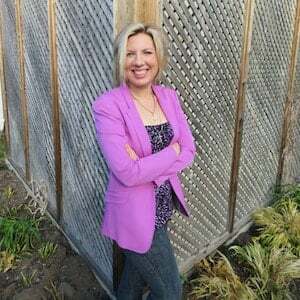 Personally, I love Mandi Ehman’s Family Chore Planner, which provides twelve weeks of chores that need to be done in your home (on a quarterly basis), so that everything will get done in its time. You just pick chores and assign them to people. Keep the chart on the fridge or in your home’s command centre, and then make sure they get done by a specific date (say, Saturday at noon). Having a visible list is all the motivation that some people need. The other “system” that often works is to set “cleaning hours”. My mother and I did this growing up, since my mom worked outside the house. Every Saturday morning we cleaned the whole place. She wanted to take evenings mostly off, since she was tired, so Saturday was our cleaning day. And we both worked until everything was done. So if you don’t like the idea of assigning chores, you could also just decide on a specific time to get everything done (this often works well for newlyweds, too, when each works outside the home). Once your kids reach 3 or 4, then you no longer have just two people in the house who can do chores. Kids can and should be put to work, too! When my girls were 5 and 6 they thought cleaning toilets was the best thing in the world. They would fight over who got to make the bubbles in the toilet. Small children often LIKE to clean, so include them in the Family Chore Planner when they’re young, and they’re more likely to continue to clean as they get older. (the Family Chore Planner also helps you figure out what age kids can do what chores). No one should feel taken for granted. And I’ve seen this happen in two extremes: either the wife does absolutely all the housework (and often some paid work) and the husband expects to be “served”, or the husband works outside the home and then comes home to a disaster where he has to do most of the housework, too. Sometimes we women need to step up to the plate and learn how to clean. We’re not born being organized, and sometimes we need a jolt. But sometimes our husbands also need to know that we aren’t maids, and that we do deserve respect. If you feel as if your husband will not compromise and does not think that he should do any work, then you need to have a discussion with him where you lay out all the things that go into running a household, and explain how tired you are, and ask which ones he’d like to leave undone. Or perhaps it’s time to ask a mentor couple to help you work this out. Here’s the main takeaway: There is no one size fits all when it comes to splitting household chores, but you can find a system that works for your family. We all need to feel productive, but we all also need a break. So let’s talk about how to get there practically. Have you ever struggled with finding this balance? 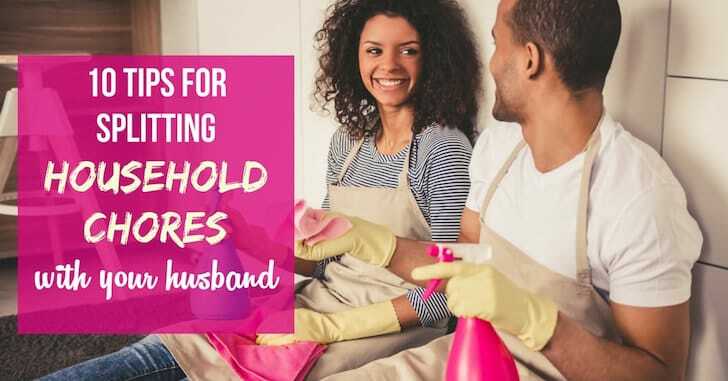 What did you do to divide housework in your marriage? Let me know in the comments! Reader Question: Do I Have to Be My Husband’s Maid? « Reader Question: Do I Have to Be My Husband’s Maid? This is just a great breakdown. I love this approach from top to bottom – especially the 100%/100% approach and the idea of combining specialization with everyone knowing how to do every chore. I think it’s really important that everyone in the family have that kind of life-skill knowledge too. We try to do that at our house. Great list! Glad you liked it, Bethany! I do think it’s important for everyone to know how to do something–cook a few meals, locate the finances. It scares me when people really don’t. We’re not all healthy forever, and life does happen. Let’s not make those hard times in life even worse! Yikes. We both work full time and have no kids. My job is a desk job, whereas my husband’s job is outside, all day, in the elements. I like to let him come home and just relax, so I really try to do everything (partly because I like it clean and partly because it’s a way of serving). If there’s something that I know I can’t do or get to, I tell him and he willingly and immediately helps me. What has really helped has been doing little things every day and keeping in mind that not only is it good for us as a couple, it’s good for him to not have to worry about keeping house. He does the bills, and I’d do everything else inside and outside of the house to not have to worry about that 🙂 Plus I see how happy it makes him to come home to a clean house, especially kitchen. As far as knowing how to do everything: I broke my leg in December and could not walk for 7 weeks, and there were many things I physically could not do. He took over everything around the house, including grocery shopping, and probably did it better than I could! I love that he could step in! That’s perfect. And I know what you mean about a guy coming home and just being physically tired. Sometimes I actually like doing housework because it makes me stand up when I sit down all day. Yes! If you can afford it, I find that a housekeeper just reduces a lot of stress. Ha! 🙂 Yes, I hope your kids will! But a lot of the printable lists will probably help you (and they don’t require much reading. : ). Oh, my goodness! I totally meant to do that. I’m so sorry. I’ll put the link in as soon as I get it from her. I KNEW there was something I was forgetting this morning! I really do like that planner, too. My husband and I I both work right now, so we do Saturday morning clean-up! We have a list of chores that need to get done each week and just tackle them together! It’s a pretty good system, although we still have some kinks to work out- for example, we both hate doing the dishes and laundry when we’re tired after work, so those things pile up more often than I’d like to admit. But I feel like we both put in our fair share and are usually happy with how clean our home is! Yeah, that’s what my mom and I used to do as a kid. It worked well for us! Yes. 100% to splitting 100/100 and also to everyone knowing how to do everything. I mostly cook in our house because I LOVE it. But while hubby is a great cook too, he needs time to think about what he is going to make so I have learnt I can’t just spring it on him when he gets home. Or if I do, I need to accept that it might mean tinned soup or takeaway. And you know what. That’s ok. If I’m that tired i can’t cook. Tinned soup that I don’t have to heat up works just fine. 🙂 If I give him time though he makes a great meal! I love the swapping chores idea! That’s great! Used to have major fights with my boyfriend over stupid fight about who’s gonna take the cleaning duty. Until one day a friend of us send us an eufy RoboVac as gift. It is actually much easier than we thought to solve the problem with the help of this little robotic assistant. We can get our house cleaned with minimum of efforts and let the RoboVac do its thing.